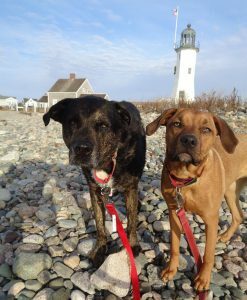 The Adventures of Shadow and Wilma – Dog friendly hikes and exploring, mostly around New England. Our Adventures includes: waterfalls, the beach, conservation land, lighthouses, state parks, the woods, the mountains, statues, and castles. Back in October of 2015 Shadow, Buster, and I Adventured to the Chesterfield Gorge Nature Area in Chesterfield, New Hampshire, also referred to as the Chesterfield Gorge State Wayside. This Area is a small state park at just 13 acres that features the Wilde Brook, a trail, and a rocky gorge with waterfalls. There are picnic tables and a visitor center that is open in season. We had a fun Adventure to the Chesterfield Gorge. As you may have heard my Throwback memory is not as detailed as I would hope. However, I remember finding the location almost to ourselves. We began following a trail along the River, and ended up finding us to a scenic little bridge, where I was able to take one of my many, all-time favorite photos of Shadow and Buster. The Gorge was simple, but tall, fenced off in several areas, and although I guess this was for safety, it really interfered with the true nature experience. I believe the trail looped around in almost a “u” shape with some up and down climbing alone the way. It was a short walk but we certainly took our time enjoying the great outdoors. We found different spots to sit and relax, the boys enjoying many sips and dips in the River. Definitely a wonderful Fall day at the Chesterfield Gorge. I have include a quite amateur sideways video at the bottom, but it gives you a good visual of the main gorge-waterfall. I do hope to be back to visit the Chesterfield Gorge. Today Shadow, Wilma, and I Adventured to the Francis William Bird Park in Walpole, Massachusetts. The Francis William Bird Park is owned and maintained by the Trustees of Reservations. There are approximately 89 acres of landscaped property, open fields, recreation areas, and several ponds. The Park has approximately three miles of walking trails. We had an overcast Adventure to the Francis William Bird Park on this Easter afternoon. I was thrilled to find this lovely little Park, unique in so many ways. We arrived at the main parking lot, crossed the street, and landed in an open field. We were greeted by The Trustees of Reservation kiosk which provided paper brochures with maps and information. The initial plan was to follow particular trails, but the paths were not labeled creating more work to view the map continually. Therefore we chose to wander aimlessly allowing our snouts and eyes to direct the route. Our first highlight was the “Music Court” probably my favorite non-nature aspect of the Park. It was a classic and distinctive architectural structure allowing oneself to imagine being at an outdoor event. There were even some sweet little ones appearing to perform a show of their own. A simple, yet scenic feature of the Park. From there we strolled to various locations throughout the Park. I adored the flowering trees, distinct “footbridges”, Beech trees, gurgling brooks, and water features. Wilma loved watching the ducks, while both Shadow and Wilma relished the ponds, and attention from as many visitors as they could real in. The trails varied from cobblestone to rocks to dirt, adding variety. There were additional labels and information kiosks around the property which was very helpful, and also educational. Lastly, I was quite pleased to find a place where ALL of the dogs we encountered were under voice, or leash control of the owners. Sadly this is not always the case, and it is something I really do appreciate. Yesterday Shadow, Wilma, and I Adventured to Kimball Farm in Carlisle, Massachusetts. We have been to Kimball’s in Westford, but this was our first visit to the Carlisle location. Kimball’s Farm began as a dairy farm in 1908, with the Kimball family selling milk whole sale. In 1939 they opened an ice cream parlor, and began making handmade ice cream. Kimball Farm has grown over the years, and Carlisle is one of their expanded locations. The Kimball Farm continues to be family owned. We had a delicious Adventure to Kimball Farm- Carlisle – on this humid and rainy day. I was excited to check out this location, a much quieter spot in the world of Kimball’s. I ordered our favorites – peppermint stick and dog ice cream. We enjoyed our tasty treats, and walked around the building checking out the location. There were benches, and some farm animals over to the side. Wilma was far from a fan of the goat so we did not spend time near the animals. It was nice to see the beautiful flower arrangements, singing spring. We definitely will be back to this tasty, quiet spot (Rating: 4). Today Shadow, Wilma, and I Adventured to The Old Manse in Concord, Massachusetts. The Old Manse is a historic manse famous for its history and literacy associations. Writers Ralph Waldo Emerson and Nathaniel Hawthorne both lived in this property at one point in their lives. The Trustees of Reservations runs The Old Manse which is now a museum that offers Tours and houses a bookstore. The Old Manse neighbors the Minute Man National Historic Park, and is a National Historic Landmark. We had a humid Adventure to The Old Manse after a rainy morning. We were inspired by The Trustees of Reservations, and decided to visit The Old Manse to take some photographs. We have been to this area before, but choose to concentrate on The Old Manse, its history, and the grounds. Parking was available right in front of the building, which was quite convenient. We headed directly to this scenic structure, soon being greeted by an information board about the property. From there we strolled past and around The Old Manse. It was exciting to see some spring blooms, a recent and jovial sight for us New Englanders! The Old Manse, and area surrounding is very picturesque. There are beautiful stone walls, gorgeous landscaping, and other landmarks in site. Wilma hopped on several rocks, Shadow enjoyed a dip in the River, and both pups enjoyed some cheerful rolls in the grass. Often we found ourselves wandered aimlessly in attempt to notice all the little details. We were pleased to visit The Old Manse today (Rating: 3). If you are interested in reading more about our visit to the neighboring Minuteman National Historic Park you can type the name in the “Search Box” (you will see the “search box” at the bottom of the page on a mobile device, and to the right side if you are utilizing a computer).